Gonzaga made it look easy. The 15th-ranked Bulldogs opened a large lead early and then cruised to a 103-68 victory Wednesday night over the University of the Incarnate Word. Gonzaga, a Final Four team a year ago, jumped on UIW 19-2 and then kept pouring it on en route to a 49-26 lead at the half. In the game played at the McCarthey Center in Spokane, Washington, forward Rui Hachimura scored 18 points to lead four Gonzaga players in double figures. The Bulldogs (6-1) shot 54.4 percent from the field to hand UIW its third straight loss. On the defensive end, Gonzaga held the Cardinals (3-3) to 43.9 percent and 15 points under their scoring average. Point guard Jalin Hart led UIW with 17 points. Cardinals forward Charles Brown III sat out his second straight game with a lower leg injury. Josh Perkins sparked Gonzaga in the first half by hitting all five of his shots from the field for 13 points. In the early going, Simi Socks knocked down a jumper for UIW to tie the score at 2-2. From there, Gonzaga rattled off 17 straight points. A three-pointer by Perkins with 14:30 left in the half made it 19-2. Sacramento State has canceled Saturday’s men’s basketball game at the University of the Incarnate Word, according to a news release from UIW. UIW released the information on Wednesday afternoon. A Sacramento State spokesman said Thursday “we bought out of the game in early October” after reaching a deal to play in the Wooden Legacy tournament. The spokesman said Sacramento State has agreed to pay UIW $100,000 in compensation. UIW will play its next game Dec. 5 when it hosts Texas Lutheran. Brown’s injury is a blow to the Cardinals, who rely on him for scoring and rebounding. He sustained the injury late in a Nov. 22 home game against Loyola Marymount. Brown, who averages 14 points and 5.5 rebounds, has now missed the past two games. In the three-game skid, UIW has lost at home to Loyola Marymount (91-87) and on the road at Houston (97-58) and at Gonzaga. UTSA freshman guard Jhivvan Jackson scored a career-high 29 points, but Tulsa dominated on the glass at home in a 100-96 victory Tuesday night. The Golden Hurricane won the rebounding battle, 47-27, which served to off-set 15 3-point shots by the visiting Roadrunners. Tulsa outscored UTSA 21-6 on second-chance points, many of them coming as a result of 15 offensive rebounds by a swarm of athletic, long-armed players. Trailing by 13 points with 4:53 remaining, the Roadrunners didn’t give up. Instead, their offense started to roll with a 12-3 run. Three-pointers by Giovanni DeNicolao, Deon Lyle and Jackson trimmed the Tulsa lead to 87-83 with 2:21 left. With Tulsa making just enough free throws down the stretch, UTSA couldn’t get any closer until the final shot, when George Willborn III nailed the team’s 15th trey with 4 seconds left. Jackson hit 6 of 12 from the field, 3 of 7 on three pointers from long distance and 14 of 15 at the free-throw line. “All my teammates (were) just putting me in the right spot, giving me right looks and coach was just trusting me in my game,” Jackson said. UTSA: Jhivvan Jackson 29, Keaton Wallace 17, Deon Lyle 14, Giovanni De Nicolao 12, George Willborn III 11. Tulsa: Junior Etou 20, Sterling Taplin 18, Curran Scott 16, Martins Igbanu 10. At home: UTSA returns home to play the Ottawa Spirit from Sunrise, Arizona, on Thursday night. On the road: The team will hit the road again with games at Utah Valley on Saturday and at Oklahoma on Monday. Nearly a year has passed since UTSA coach Steve Henson had a chance meeting with a student after one of the Roadrunners’ home basketball games. As it turned out, this particular student towered over most fans in the Convocation Center that night. He was 6-feet-8, and he also carried 220 pounds on a chiseled frame. Henson didn’t know all the details, but Kendell Ramlal was looking for a chance to play. “What’s your story?” the coach asked. Ramlal spelled it out. He once played for Episcopal High School in the Houston area. He played three years at Texas State. And now he was just a student at UTSA, working out and playing 5-on-5 in the rec center, looking for another opportunity. Not too many days went by before Ramlal’s phone buzzed. A year later, Henson is most happy to have made Ramlal’s acquaintance. The fifth-year senior is starting to take on a significant role for the Roadrunners, who play on the road tonight at Tulsa. In the past two games, Ramlal has come off the UTSA bench, gradually seeing more and more court time as his confidence grows. Henson played him 17 minutes in a 72-58 victory over Texas A&M-Corpus Christi last Friday. He responded with a career-high 11 points, four rebounds and three blocks. “We knew he could help us defensively,” Henson said. “But he’s making the right plays. Big blocks. He rebounds. Guards his own guy. Henson said he is surprised with Ramlal’s emergence. “Honestly, yes,” the coach said. “He surprises me that he’s doing it while the lights are on. He had some days where he did that in practice. He did it in June. “Just didn’t know as we got closer to the games, (if) he was going to do it when the pressure was on. After punishing Texas A&M-Corpus Christi with his hustle and all-around play, Ramlal smiled and admitted that it feels great to contribute.. He said he sees himself as UTSA’s “energy guy,” hitting the floor to boost the team when it needs a push. “Definitely,” he said. “I’m the energy guy. I’m a fifth-year senior, so I bring a lot of leadership. I’m honestly the biggest, strongest guy out here, so I try to show the guys – lead by example – how to be the bigger and tougher guy. UTEP basketball coach Tim Floyd retired Monday night after the Miners lost at home to the Lamar Cardinals, the El Paso Times reported. “I’m done, this is my last game as a coach,” Floyd said. The Times said the move came a day after Jim Senter was introduced as the school’s athletic director. Floyd said later that his decision had nothing to do with Senter’s arrival. With the loss, UTEP fell to 1-5 on the season. Floyd was starting his 24th season as a college head coach and his eighth at UTEP when he abruptly stepped down. He had also worked five seasons as a head coach in the NBA. With deep roots in El Paso, he started his coaching career at UTEP from 1978-86 as an assistant under the legendary Don Haskins. As a collegiate head coach, he worked at Idaho, New Orleans, Iowa State, Southern Cal and UTEP, compiling a record of 465-280, according to online records. He coached eight NCAA tournament teams, including two at New Orleans, three at Iowa State and three at Southern Cal. After six seasons in the NBA, including parts of four as head coach of the Chicago Bulls, Floyd returned to the college game at UTEP in the 2010-11 season. He led the Miners to three seasons of 22 wins or more but never was able to reach the NCAA tournament. Floyd took UTEP to the NIT in 2011, to the CBI in 2014 and to the NIT again in 2015. In seven plus seasons with the Miners, he finished 138-99. Floyd’s father lettered in basketball, football, swimming and gymnastics at the school from 1939-43. UTEP has a unique place in college basketball history. In 1966, the school known then as Texas Western College became the first to win the NCAA championship with an all-black starting lineup. The Miners remain as the only team in the state to win an NCAA Division I title. The state of Texas is well-represented in the latest installment of the Associated Press Top 25 for men’s college basketball. On the heels of a blowout victory over Southern Cal, Texas A&M has moved up to No. 9. Baylor is 16th, Texas Tech 22nd and TCU 23rd. The Aggies improved to 6-0 on the season after beating USC 75-59 on Sunday in Los Angeles. Big stage for the young man. D.J. Hogg scored 15 points in a 19-3 run in the second half for the Aggies. Duane Wilson produced 13 points and Tyler Davis 10. One of the most encouraging signs for A&M was the pay of freshman guard T.J. Starks, who produced 10 points in 14 minutes. Texas A&M entered the season looking for redemption after failing to make the NCAA tournament last spring. In the opening weeks of the new year, the Aggies have knocked off West Virginia, Oklahoma State, Penn State and USC. A&M returns home to face UT-Rio Grande Valley on Thursday. The team’s next major test is Dec. 5 in Phoenix against Arizona. It’s early Monday morning now, and the highlights are still rolling on ESPN. Most of them involve Duke freshman center Marvin Bagley III. Bagley produced 30 points and 15 rebounds Sunday night as the Blue Devils erased a 17-point, second-half deficit to stun Florida, 87-84, in the PK80 tournament Motion Bracket final. Florida controlled the action early in the second half, building a 74-57 lead when Egor Koulechev made two free throws. But down the stretch, Duke’s size and athleticism started to take a toll. The Gators couldn’t do much to stop Bagley, who posted down low to score 10 during the Blue Devils’ rally. Gary Trent Jr. made four straight free throws in the final 1:11 to seal it for Duke. With a chance to tie at the end, Koulechev faced defensive pressure and threw up a wild shot that missed as the buzzer sounded. Duke fans have seen this type of performance before, from Bagley and from their team as a whole. Bagley produced 34 points and 15 rebounds in the tournament semifinal against Texas. In that game, the Blue Devils erased a 16-point deficit to beat the Longhorns 85-78 in overtime. Forward Theo Pinson is averaging 10.2 points, 5.2 rebounds and 4.4 assists this year for North Carolina. Oh, and, he can also get off the floor. Way out West, Texas and Gonzaga have tipped off in the made-for-television PK80 tournament at the Moda Center in Portland, Oregon. It’s the third-place game in the tournament’s Motion Bracket. I’m watching from my living room in San Antonio, the home of the 2018 NCAA Men’s Final Four, all set to watch this game and a few others today and tonight. Anxious to see the Longhorns for the first time. Also, we’ll try to size up North Carolina- Michigan State, which starts at 7:30 tonight, and Duke-Florida, which is set for 9:30. So, if you need a break from the National Football League this afternoon, check back with thejbreplay.com for some observations. I’ll be here all day. The Longhorns, who played well in an overtime loss to Duke on Friday, have hit the wall. They jumped out to a 16-8 lead on the Bulldogs. Now early in the second half, the Bulldogs have surged into a 48-33 lead. Texas freshman forward Mo Bamba has five points, seven rebounds and three blocks. Bamba has been pushed around a little bit by Gonzaga’s big guys. He looks out of sorts at the moment, with the Bulldogs on their big run. Bamba is one of those players who will inspire your imagination, and then he’ll take an ill-advised three from the top of the circle. Jones, who played in high school at East Central, is on the floor for the Zags. A transfer from Rice, he’s averaging 3.4 points in 9.6 minutes off the bench. Havoc is on display in Portland. Where it's been until now is beyond me? But Horns now trail by 4 with 2:07 left. Possible scintillating finish ahead. Texas has erased a 21-point deficit and has tied the game against Gonzaga at the end of regulation. The Longhorns outscored the Zags 15-4 in the last few minutes. Bamba hit a bucket and then forced a bad pass on the inbounds, which Texas intercepted and turned into a buzzer-beating three. In overtime, Gonzaga forced a few turnovers, kicked its transition game into gear and subdued Texas, 76-71. Michigan State’s Jaren Jackson, Jr. I can still remember Jaren Jackson hitting big threes in the Spurs’ first championship season, in 1998-99. Tonight, his son will take the spotlight when Michigan State plays North Carolina in the finals of the PK80 tournament. Freshman center Jaren Jackson, Jr., is starting for coach Tom Izzo’s Spartans. Through two games, the former McDonald’s All-American is averaging 12.5 points and 10 rebounds. In 1999, his father enjoyed two of the biggest games of his career in Portland, in the same arena that Michigan State and Carolina will duel tonight. Back then, it was known as the Rose Garden. In June of 1999, Jaren Jackson, Sr. came off the bench to score 19 points in Game 3 and 11 points in Game 4 as the Spurs swept the Trail Blazers in the NBA’s Western Conference finals. Jaren Jackson, Jr., a projected lottery pick in the next NBA Draft, didn’t have much of an impact on the finals of the PK80 Victory Bracket. The Michigan State freshman center picked up two early fouls and sat out most of the first half. A flagrant foul — questionable, in my view — sent him to the bench in the second half. Nevertheless, Michigan State throttled North Carolina, 63-45, holding the Tar Heels to 24.6 percent shooting. Sophomore guard Joshua Langford led the Spartans with 23 points. Jackson, considered a “stretch-four” because of his ability to shoot from distance, finished with three points, five rebounds and two blocks. He started the tournament with a flourish, producing 13 points and 10 rebounds against DePaul and 12 points and 10 boards against Connecticut. Riding the hot shooting of KeVaughn Allen and Chris Chiozza, Florida jumped on Duke in the opening minutes of the PK80 Motion Bracket title game, moving out to leads of 18-4 and 24-10. Did Duke flinch? Hardly. Center Marvin Bagley III led a rally that propelled the Blue Devils to a dominant run. At one point, Duke was up 44-37 and cruising. But Florida settled down, kept playing and took a 53-47 lead into into intermission. Great up and down play by two talented teams. Where did Florida get all this talent? Jalen Hudson is destroying Duke right now with 22 points and 10 rebounds. Gators are leading the Blue Devils 80-70 with 5:29 remaining in the game. Duke’s size is starting to take a toll on Florida. Blue Devils are on a 24-10 run. Florida’s lead is down to three. We’re about to see a great finish here. Two free throws by Gary Trent, Jr., give Blue Devils an 85-84 lead. Less than a minute remaining. Jalen Hudson turns it over on the dribble. Trent hits two free throws. Duke now up by three. There’s 8.9 seconds left. Florida with possession. Bagley has 30 points and 15 rebounds. Duke wins 87-84. I do my best to avoid the Black Friday shopping scene. It’s just not appealing to think about walking elbow-to-elbow with hundreds of others in a mall concourse on the day after Thanksgiving. Even though I know I will need to make a few purchases at some point before the Holidays, I will take a pass today in pursuit of a few more leisurely pursuits. Specifically, I’m on my way to the Leon Creek Greenway. Instead of battling the crowds, I’ll try to find some peace out there on the concrete path that runs through Northwest Bexar County. Later, I’ll head over to the UTSA Convocation Center to watch some basketball. Both the UTSA women and men are playing later today. Northern Illinois scored 17 of the first 19 points and then held on to win, 69-55, beating the home team on the first day of the two-day UTSA Thanksgiving Classic. Forward Kelly Smith produced 15 points to lead five players in double figures for Northern Illinois (4-1). Sophomore forward Tija Hawkins led UTSA (1-4) with 13 points. The Roadrunners have lost four straight. Maybe they can get a few problems ironed out before they take on North Dakota on Saturday at 2 p.m.
Don’t tell anyone, but I’m running late for the men’s game between Texas A&M-Corpus Christi and UTSA. No excuses. Just had to get some dinner and some coffee in between the afternoon contest and the nightcap. As I get settled into my seat at press row, I see UTSA has the game well in hand, leading 33-23 with 3:30 remaining. Freshman Jhivvan Jackson, UTSA’s leading scorer, is dressed out. He’s on the bench. But he hasn’t played yet. UTSA now leads 41-27 at interimssion. The Roadrunners defeat the Islanders 72-58. UTSA improves to 4-2 on the season. The University of the Incarnate Word on Wednesday night showed flashes of high-level execution on the offensive end that seemed to frustrate the Loyola Marymount Lions. At times, the Cardinals would simply out-run the Lions from the West Coast Conference, pushing out to leads of 10 and 12 points in the first half. 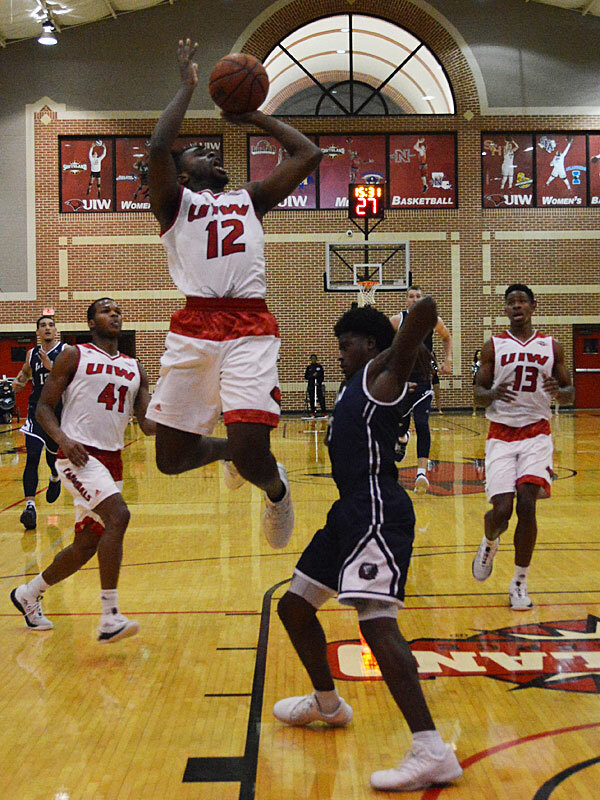 But in the end, the Lions wore down the Southland Conference’s Cardinals with bigger athletes and a more physical style, rallying late in the second half behind point guard James Batemon for a 91-87 victory. Trailing by seven in the second half, the Lions called on Batemon, who scored 10 points in a row to give Loyola Marymount a 77-74 edge with 4:25 remaining. The Lions never trailed again. “Their point guard, Batemon, at the end of the game, he took it at us,” Burmeister said. “I thought both teams played with great effort. We missed a couple of inopportunity free throws (at the end). Batemon scored 20 of his game-high 26 points in the second half for the Lions (3-1), who won their third game in a row and their first of the season on the road. Forward Eli Scott also did some damage, moving around with a muscular frame to produce 19 points and 12 rebounds. Loyola Marymount essentially won the game on the boards, out-rebounding UIW 43-23, including 19-11 on the offensive glass. For the Cardinals (3-1), redshirt freshman forward Christian Peevy hit 6 of 8 shots from the field and scored 20 points off the bench. Starting forward Shawn Johnson enjoyed a strong overall game with 18 points and nine rebounds. He also produced two blocks and two steals. But Johnson, s 6-5 senior from New Orleans, was held to only three points in the second half. He was not pleased with himself or with a rash of mistakes by his teammates in the last five minutes. “At the end, at home, you can’t miss free throws like that, no matter who it is,” Johnson said. “That’s on us. We lost by four. We missed jump shots. We missed easy layups. We lost that game. I had a dumb turnover. Incarnate Word plays on the road Saturday at the University of Houston. The status of forward Charles Brown III is uncertain. Brown went down with a leg injury in the second half and didn’t return. Point guard James Batemon scored 20 of his game-high 26 points in the second half Wednesday night as Loyola Marymount rallied to beat the University of the Incarnate Word 91-87. With Loyola Marymount trailing by seven, Batemon scored 10 points in a row to lift the Lions into a 77-74 lead with 4:25 remaining. Loyola Maymount (3-1) never trailed again. 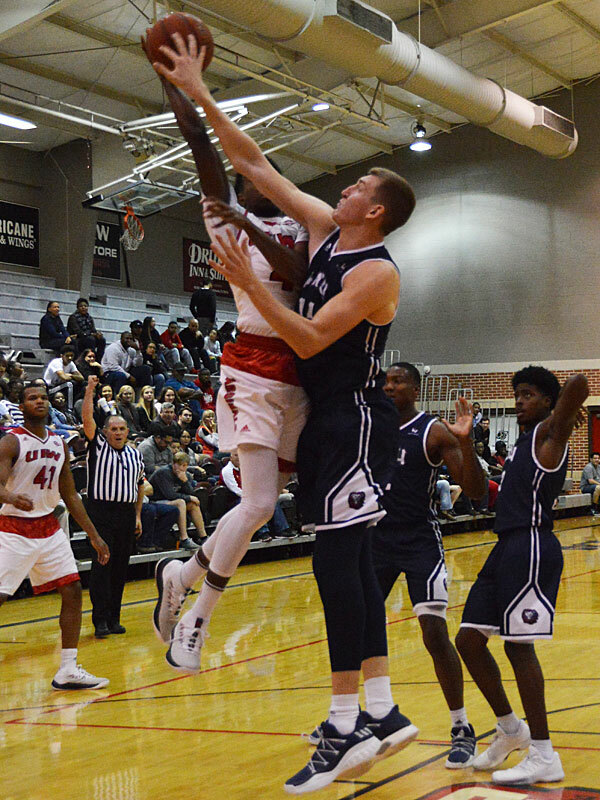 Freshman forward Christian Peevy scored 20 off the bench for UIW (3-1). Senior forward Shawn Johnson pumped in 15 of his 18 in the first half, when the Cardinals took a 46-41 lead into the dressing room at intermission. Near the end of a physical, fast-paced contest, UIW post Charles Brown III suffered a right leg injury and had to come off the floor. The Cardinals play next on Saturday at the University of Houston.